Sometimes I just feel like quitting. I just feel like I need to put down the pen and stop writing. Right in the middle of the current project. Right in the middle of whatever I am writing. Right in the middle of the current sentence. The feeling usually goes away, but there are times when it looms. 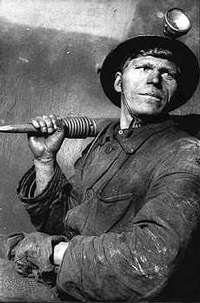 During those times when I feel like quitting, I think about the proverbial miner. This miner just knows he is going to hit the mother lode so he keeps digging and digging and digging. But eventually, even though he has put in all the blood, sweat, and tears, even though he just knows he is digging in the right place, even though he believes he will strike it rich, he stops. He gives up when things are the toughest. When things are going wrong. When the last cave-in dampens his spirits the most. When he is at his lowest, he shuts down the mine and leaves. Little does he know that the last cave in, the last hurdle, the last shovelful of dirt that he would have made had he kept digging would have been the best. It would have shown the rich vein of ore that he knew would be there. But he gave up too soon. Unlike that proverbial miner, I keep digging. I keep believing that the next shovelful of dirt will contain the rich ore. I might take a break or rest for a time, but I keep digging. And I will keep digging whether or not I find any ore. Ever. Of course, writing is much easier work than digging. After all, I just throw stuff out there on the world wide web and see what sticks. I just keep putting out drivel for all to see and hope that someday I write something worth reading. I just keep going. Even if I am not on the right path. Some days, I feel like quitting. I feel that I should just put down the pen for good because nobody is reading anyway. Then, I remember three things. I remember the miner. I remember my friends M&M, who tease me about my drivel. And I remember that writing is like breathing. So even though I sometimes feel like quitting, I will not quit today.